April 11, 2019	Comments Off on Igor Gorgonzola Novara in CEV finals! 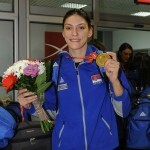 March 25, 2019	Comments Off on Eczacibasi won second trophy this season! February 4, 2019	Comments Off on The first trophy for Strefana in Italy! December 24, 2018	Comments Off on The best of the best! December 11, 2018	Comments Off on Tijana’s Eczacibasi VitrA Istanbul won bronze! Tijana Boskovic – Back to back CEV Female Volleyball Player of the Year!